Whether or not people realize this, we are close to the end of everything we know. I am not talking about an End of the World scenario: an Armageddon of Climate Change, World War or Nuclear Holocaust. I am however, nonetheless, talking about a true Apocalypse. However, I am using the term "Apocalypse" in the actual meaning of the word which is "an unveiling or drawing back of the curtain." The curtain that is about to be drawn back is the fact that humans are soon going to become a completely superfluous ornamentation. We are very quickly becoming unnecessary, even a liability to the global capitalist economy. And because of this, we will either face a Terminator-esque future (which I think is highly unlikely) or we will live to see our economic system completely collapse. However, given the bleakness of my last blog, and CGP Grey's Video, I want to propose a very different future, a future, by the way, that Gene Roddenberry prophesied. And I should note, that I am beginning to believe that he was as tapped into the future as Jules Verne was in his day. Both of them extrapolated existing trends, combined them with a genuine vision of their implications, and created models of the future we were heading toward. And that future that we face, by necessity, is going to be what I call either Post-Economic, or better yet, Post-Positional. "Positional Goods" is a term used by anthropologists to describe the items that delineate societal status. This can be anything from the feathers of the Quetzal bird to a diamond to a private Lear Jet. Basically, anything that shows your class or caste is a positional good. They function across all of the classes, but also within a class. Even in the poorest classes, there are positional goods. For example, a corner to fly a sign, or a coveted sleeping spot will indicate social position in the Homeless Community. So why would I call this new economic system, "Post-Positional?" Before I answer that question, I want to describe the economy that we will have to adopt out of necessity. That is, unless we want to go down the drain of grinding poverty, mass famine, dying children, and ultimately endless revolution. And that economy is going to look a lot more like Karl Marx than Adam Smith. But, I should note, I am not talking about Communism as implemented by the Soviets or any of their satellite countries. I am talking about a return to a true Egalitarian Society, a Utopia that Marx envisioned, but with the technology of the 20th Century was utterly unattainable. Marx's theories were 150 years too early, because we lacked the technology to make them work. In short, with even current technology, someone needs to service the sewers, someone needs keep the peace, someone needs to draw the buildings, and someone needs to build them. And lacking any monetary incentive, everyone wants to do the fun things, and no one wants to do the hard, dirty or downright disgusting ones. And therefore, to make the system function, you have to have one of the most draconian, totalitarian governments imaginable. Basically, without money, you have to use brute force to make the system function. And this is why, in the end, Capitalism won; it was the least brutal system that actually brought the most stability and prosperity. At least for now. So to return to my point, we are going to be forced to adopt an economy straight out of Star Trek: the Next Generation. In that series, there was an episode when the crew discovered a set of space-farers that had been cryogenically frozen for centuries. When they found out that the Federation was moneyless, and further, no one worked for wages in the manner they were familiar with, one of them asked "what was the point of life." Picard responded, "to strive to make yourself better." So basically, the future as envisioned by Gene Roddenberry is one where people do the things they want, to become better people, and to leave the world (or universe) a better place. While that seems like a Utopian Fantasy, we will have no choice but to figure out how to make it real. Again, the alternative is to have starvation, revolution and slaughter. So, with the automation world, very few jobs will remain that cannot be done by robots, or other sorts of thinking machines. Now, we could demand that laws be passed to not allow robots to do any job that can be safely done by a human. This is what I proposed in last week's Blog. However, this will not fly with the Capitalist system or the "Masters of the Universe" They will demand that no such laws be passed, because that will cut into their maximization of profits. 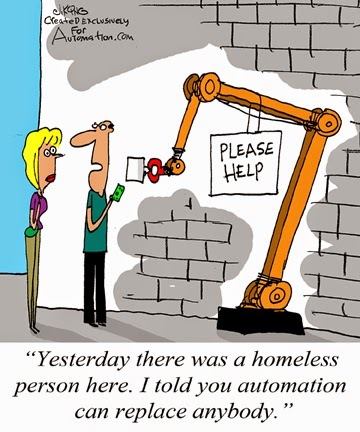 They are going to insist that they be allowed to replace all of their workers with automated systems, because it will put the most money in their pockets at the immediate time. And it is important to note, Capitalism is somewhat poor at planning past the next economic quarter, and it is terrible in planning for the ten year horizon. So in the end, with 80%+ of the population on the Dole, the taxes on the remaining 20% will become utterly unsupportable. I don't mean to get all Ayn Rand here, but really, that 20% will just stop working, because the government will HAVE to take almost 100% of the money they make in order to make the system work. Basically, each working person will have to fully support at least four other people completely. It is a completely unsustainable system. In Atlas Shrugged, Ayn Rand said the "Makers" will just all go on strike and stop producing, bringing the system to a halt and making all of the worthless "Takers" recognize that they are leaches on society, at which point, they will let the precious "Makers" act without restriction. That is a childish fantasy. Oh, for certain, the "Makers" will stop, go on strike as it were. That will be inevitable. However, the rest of us won't miss them at all. In fact, without them pulling the levers of society, we might be able to actually accomplish this transformation to the Post-Positional system. So with that, food, shelter, clothing and all of that will essentially become free with automation. This effect will do nothing but increase as "replicator" technology comes on-line. Right now, we call that technology "3D Printing" technology. But as it increases in quality, and the types of things that can be made increase in diversity, it will emulate the replicators of Star Trek. And at this point, there will be no want in society that is not instantly filled, and filled for no actual monetary cost. Of course, this is dependant on us not imposing some sort of arbitrary barrier, just to make sure that societal status gets preserved. And this is why I call this Economic System, "Post-Positional." So in this world what happens? Well all of the work is done by the machines and by the bots, leaving people completely unemployed. However, people need to occupy their time in order to feel fulfilled. For the most part, people don't handle idleness well. Which leads to the other part of the Star Trek future; people will work at self improvement. They will spend their lives learning, practicing, experimenting. They will be free to explore whatever takes their interest. There will still need to be some jobs, especially in the creative arts, but the people who do them will be doing them because they want to, not because they have to. And the amount of time spent on them will be far less than we spend today. And here, I would like to point out the brilliance of the Star Trek Universe. The Federation was an absolute necessity. Without the Frontier, humans stagnate. If we have no challenges, we become overwhelmed with inertia. This is what the exploration culture of Star Trek promoted. It provided the drive to keep humanity advancing, developing and improving. So basically, the world we will be forced to adopt because of technology will be one where each human becomes occupied with personal growth, and one where all of the necessities of life are just provided. Further, there will be no more class, or status, at least no status based on goods or possessions, because anyone will have equal abilities to access anything they want. This will not be because of any sort of actual egalitarian thought, at least not initially, but because there will literally be no inherent costs to any goods. And because of this, there will ultimately be no need for services to have any cost either, because the people providing the services will have no expenses. People will become free to essentially do what they want, without any economic fetters. And ultimately, that is where we will have to go, unless we want the Apocalypse of Automation to become an actual Armageddon. Of course, the rich and powerful will view this future as an Armegeddon, and they will likely fight it to the bitter end. However, they will lose.